If you’re the kind of gal whose “me time” includes a glass or two of wine after work, you might want to consider how those drinks could affect your looks. Now there’s a mobile app that aims to drive that point home on a more personal level. This week, the campaign rolled out its “Drinking Mirror” app, which lets users upload photos of themselves to show how their faces could age if they keep imbibing at their current rate. The app is available only for Android-powered devices, although government spokeswoman said an iPhone version will be out shortly. A Web version is also available. 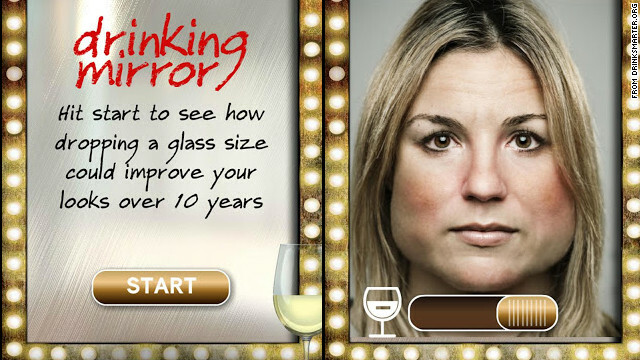 The campaign’s Drink Smarter website shows a picture of a woman to demonstrate how the drinking mirror works, along with a warning that “deeper wrinkles, red cheeks and weight gain” are just some of the visible effects of regular heavy drinking. Overall, the campaign aims to make people aware of the fine line between social drinking and drinking too much, especially when people drink in the home. Men are not excluded from the conversation. A page devoted to “drinking like a man” warns that men who have more than five drinks a day are twice as likely to die of a stroke, and that having a beer belly can increase your risk of cardiovascular disease, high blood pressure, diabetes, sleep apnea and cancer. Men and women can use the app by uploading or taking photos of themselves and entering data about their drinking habits. Then, to show the potential long-term physical toll of drinking, the app shows them a photo of how they might look in 10 years at their current rate of alcohol consumption. Even though the campaign states that “men drink more on average than women” and “suffer more ill effects as a result,” it’s targeted to women in an effort to play on their vanity, said a Scottish government spokeswoman who asked not to be named. Past government campaigns in Scotland have targeted both genders, but research shows that women in particular “are often unaware or slightly confused about what sensible drinking guidelines are,” she said. “With any public health campaign, it’s crucial to target it to specific demographic. It can be an age group, a gender or people with specific risk factors,” said health writer and body image expert Leslie Goldman, who has a master’s in public health from the University of Illinois-Chicago. She pointed out that men and women can use the app and that the Drink Smarter website offers information and resources for both genders. So how much booze is too much? On a daily basis, it’s more than two to three drinks (about a 175 ml glass of 13% wine) for women and three to four drinks (equivalent to a pint and a half of 4% beer) for men. About 38% of Scottish women and 49% of men exceed the daily recommended limit each week, according to government statistics.